I am hardly a Pollyanna. In fact most folks would probably say I'm a grouch, cynical and rather cranky. While I might present as curmudgeonly pessimist I do, deep in my heart, believe that changing this world is possible. I have seen a lot of horror in my lifetime, but I've also known a lot of people who are out there doing the work that needs to be done to make the world a better place. I have seen people's eyes be opened to the awfulness out there and I've heard them ask, "What can I do?" We might not believe that people's minds can be changed, that hearts can be opened but look at yourself. There was a time in your life when you had been closed to someone, maybe they hurt you, maybe you prejudged them, maybe you teased or bullied them, maybe you just never noticed they existed before...whatever the circumstance, there came a time when something happened the caused you to feel sympathy for that person. To relate in some way, and to understand, if only a little, their pain. That might seem a small thing, but it shows that none of us are made of stone, we are capable of change. We can say, "This isn't just your problem anymore, it's mine too." Carrying the burdens of the world is difficult but we are not carrying them alone. There are billions of us out there who want the world to be a better place, a safer place, a more peaceful place. We shoulder this burden together, each doing what we can. Each trying to live a life that promotes a more just and peaceful world. The important part is that you do SOMETHING, and do it over and over and over and over again. Because these problems are not going away with one rally or one protest or one letter to the editor. They go away when we all start living lives that exemplify the world we want to live in and when we reach out to help others do the same. And it will be uncomfortable because living that sort of life means stepping outside your comfort zone. It means acknowledging people who we might normally ignore. It means learning to see the humanity in everyone. It means failing, getting back up and trying again, and failing again. And it means speaking up when you see a wrong done, an injustice committed. Most of all it means you are no longer silent. Think of the surface tension of water. 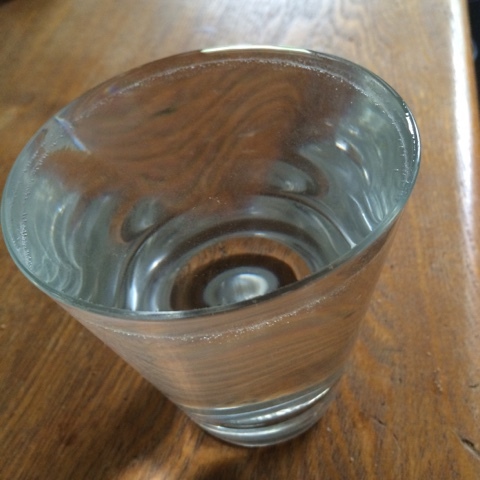 Did you ever fill a glass of water so full that there is more water than the glass can hold, and you can see that little "hill" of water that is pushing up over the edge glass but the water doesn't spill? The surface tension of the water keeps it in place. If nothing else happened - if you didn't add any water or move the glass in anyway, it would stay there, unspilled, until the water began to evaporate and eventually the glass would be empty. BUT, if you took a water dropper and started adding more water, drop, by drop, by drop...eventually there is too much water and the surface tension can no longer hold, the water will spill over the edge. The wound that our world has is far bigger than a glass of water, but we potentially have billions of drops available to fill it. The best thing we can do is the work that is in front of us, in our communities and to keep in mind both the local and global impact of our actions. A sustainable world, a peaceful world, includes environmental justice, economic justice and social justice...we can work towards all three. And yes it will take time... it only takes one drop of water to break that surface tension..but you have to have a whole lot of other drops in there first. It doesn't matter if you are the first drop or the last as long as you make it into the glass. Change often comes slowly, and we want so badly for there to be a savior to come along and fix things, but there is no other savior than us...us. A few billion of us.